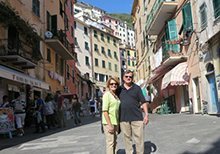 I continue to ‘bask in the glow’ of our amazing vacation in Italy! Thanks again to all of you for making it so memorable!! We are having a great time. Scenery is magnificent and the accommodations are terrific. We toast you every night with a delicious glass of Wine! 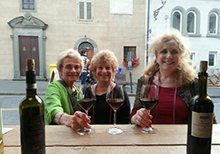 We absolutely loved our stay at Il Borgo. Marta’s attention to detail was superb. The arrangements she made with the local restaurants to accommodate Rhonda’s diet were outstanding. She even provided a separate breakfast basket for her each morning. The accommodations were magnificent and we thoroughly enjoyed the drivers and tour guides. It is impossible to say which place we liked most. They each offered something special and spectacular. We really had a fabulous time! We can’t thank you enough for your patience, guidance and wonderful suggestions. The scenery, food and experiences will be a lifetime memory. Our hotels in Rome and Florence couldn’t have been better. First class, in great locations and lovely hotel staff. The villa was exceptional. The views were breathtaking and the attention to detail was much appreciated. Marta did a great job, as did the housekeepers and drivers. The day trips were a true experience. We can see why Lori recommended you. I am very grateful for the trip you presented. 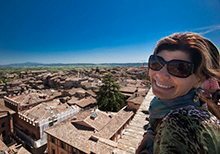 Florence and the Tuscan countryside were just a dream–and that’s from someone who has been to Italy 6 or 7 times! Everyone we dealt with was warm, hospitable, and efficient, with special kudos to Giulia at the Il Guelfo Bianco, who was so kind on my arrival there, the very gracious and terrifically well-informed Patrizia guiding us through the Uffizi, the drivers for Il Borgo, and especially all the very kind and warm people at the Il Borgo. They were so eager to help us with anything, and made this a relaxing and very fun experience. 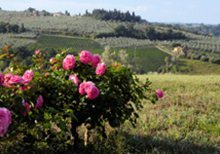 I’m telling all that the Il Borgo is just a piece of Eden–sitting on the terrace of around the pool looking over the hills is guaranteed to lower one’s blood pressure at least 20 points. 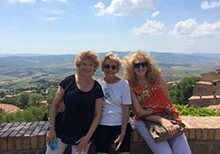 We had a fabulous trip to Italy thanks to you. 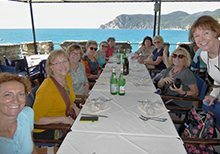 Our guides were wonderful, very informative, very friendly, and we loved having a personal guide to see so many wonderful places. The drivers were on time and very competent, although I admit I am happy not to be driving in Italy. They are crazy. 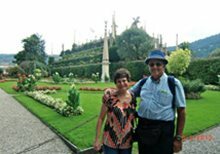 Both Lake Maggiore and St. Margherita are beautiful places, with much to see and do. The hotels you chose were wonderful, also. We were very happy with the whole experience we had and appreciate all of your help in setting it up as well as the few minor problems we experienced. Again, thank you so much. 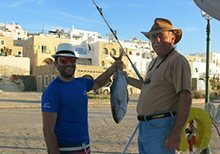 The charter services offered by Kostas & our skipper Manos (in Greece) both were over the top… Diane & our nieces are considering a repeat to Crete with Moorings in 2017 – you are awesome – Thanks! The trip was fantastic! I would recommend it to anyone and especially recommend you to arrange everything. Great service! The last night, our group went to dinner at a castle owned by the same people who owned the condos. Little did we know that part of this dinner was to honor us for the 50th anniversary. 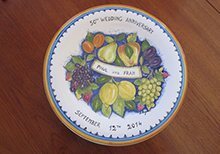 Special sparkling wine, special dessert and a huge hand painted platter with our names and the dates of our anniversary. Quite a night! All things are amazing when we are discovering cultures and worlds beyond on own, aren’t they? We thank you everyday for helping us create this experience, and also for the learning opportunities. 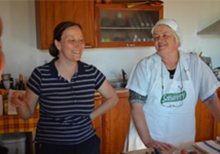 We had no idea the history and culture of Sicily would be so deep and fascinating, or that the different provinces would be so different from each other. It is not only Italy and Greece that we are learning about, but also life experiences and the world experiences of people who are all trying to make their living and take care of their families in these times of world change, isn’t it true, when you are in other countries. Bravo Gina!! !